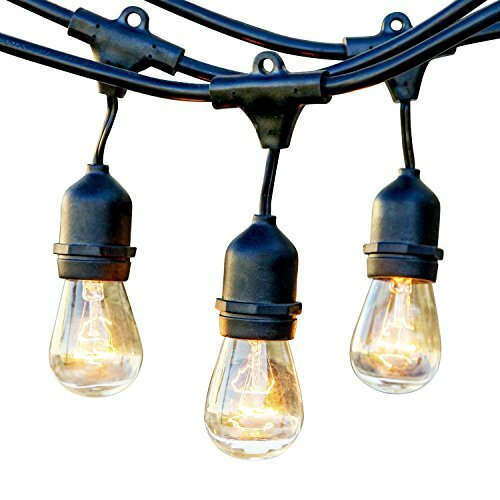 1.SIZE - 24 feet long string lights with 12pcs 11W S14 Edision Vintage Incandescent Bulbs,which have E26 socket base,1 feet lead with male plug, 2feet spacing between bulbs,end to end connectable,MAX.connect up to 5 strands.We include two extra bulbs, so you'll have two spare handy. 2.STRONGEST PATIO LIGHTS ON THE MARKET - Designed to withstand the wear and tear of year-round outdoor use. Built with durable WeatherTite technology, Ambience Pro illumines your landscape while layers of insulation protect the strand from extreme hot/cold temperatures and rainy,windy,or damp climates. Rubbery and flexible, it's much thicker than a traditional cord, so you can confidently leave this UL listed light string on display through summers and winters. 3.SOFT AMBER GLOW,DIMMER COMPATIBLE - For greater mood lighting flexibility, wire lights to a dimmer switch. Neutral casing blends with any décor while the soft lighting of the bulbs will enhance porches, pergolas, patios, gazebos, wedding receptions, nighttime celebrations, romantic dinners for two, and more. 110 volts only, will not plug into 220v outlets. Wired in parallel circuits, if a bulb goes out, the others will stay lit (avoid " checked every bulb" moment). 4.SIMPLE INSTALLATION - Use cup hooks, guide wires, or zip ties with the built-in loops to hang perfectly. Connect up to 5 strings to enlighten any event and create a festive flair. Enjoy years of illumination at any venue indoors or outdoors with just a few minutes of installation.